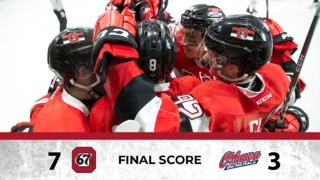 The Ottawa 67’s saw their four-game winning streak come to a halt Monday afternoon in front of boisterous Family Day crowd of over 4,500 at the Arena at TD Place. Despite a strong push in the final period, the 67’s couldn’t complete the comeback falling 3-2 with the Battalion gaining a two-point edge in the race for home ice advantage in the OHL playoffs. The game opened on a physical note with both teams exchanging big hits. The Battalion opened the scoring on the powerplay midway through the period. On a subsequent powerplay, North Bay struck again and took a 2-0 lead. Special teams seemed to be the key to offence on Monday afternoon. The Barber Poles cut the deficit in half when Stepan Falkovosky’s point shot got past goalie Jake Smith. Dante Salituro assisted on the goal, extending his point streak to 13 games (7G-12A-19 points). Liam Herbst came up big for the 67’s in the middle frame stopping some excellent scoring chances, but the Battalion were able to restore their two-goal lead in the final minutes of the period on Mike Amadio’s second of the game and 37th of the season. The 67’s and Battalion exchanged excellent scoring chances in the third period.Ben Fanjoy made a great effort to get the puck in the offensive zone and fed Artur Tyanulin who scored his 10th goal of the season. With the extra attacker out the 67’s pressured for an equalizer and despite the Battalion missing a golden empty net chance to ice the victory, Ottawa was unable to beat Smith as the Battalion escaped the third period, and the game, with a 3-2 win. With 13 games remaining in the regular season, the 67’s sit tied with Niagara for fourth (Niagara owning the tiebreaker) which would earn them home ice advantage in the opening round of the Eastern Conference playoffs. 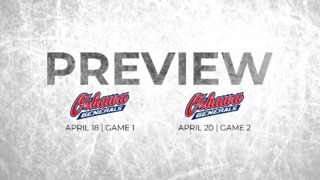 The homestand continues for the 67’s who are back in action on Friday night at the Arena at TD Place with a 7 p.m. face-off against the Eastern Conference leading Kingston Frontenacs. 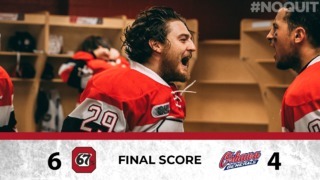 Upcoming 67’s games: February 19 vs. Kingston, Arena at TD Place; Feb 20 vs. Niagara, Arena at TD Place; February 21 at Oshawa, General Motors Centre, 6:05 p.m.